This tool (under development, expected release: December 2017) generates a small number of forms that a tenant without a lawyer can use in court: Answer and Counterclaims; Request for Discovery; Notice of Interpreter; Transfer to Housing Court; and a limited Motion to Dismiss. The focus is on asking “just the right number” of questions, with the claims, discovery and motions selected for the tenant based on easy to answer questions. 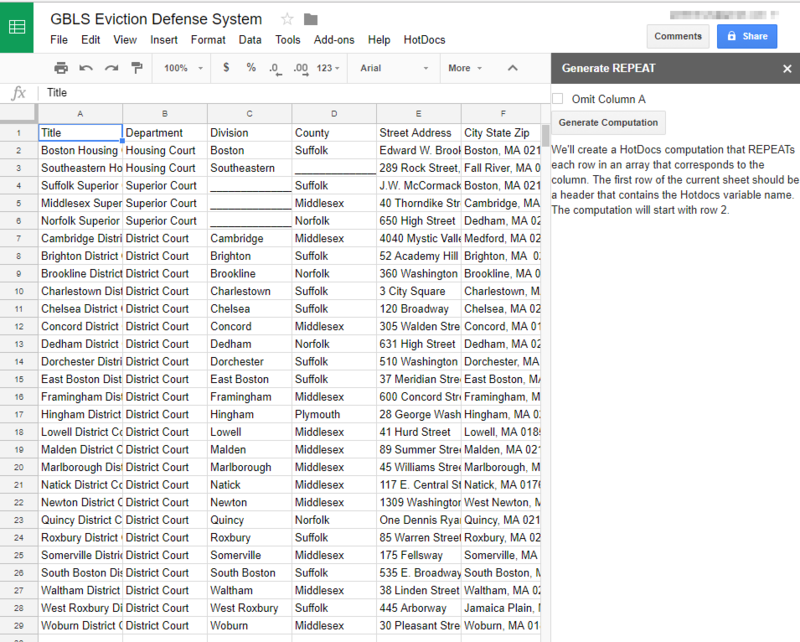 I am working with a recent graduate fellow to develop this tool which follows the forms edited by the Massachusetts Law Reform Institute available at MassLegalHelp. It is based on the very flexible and visually attractive DocAssemble platform. 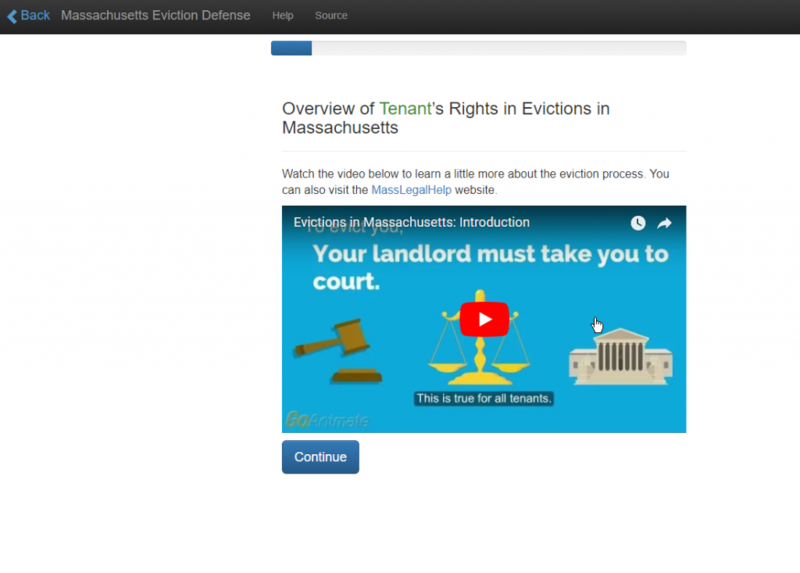 The target is pro tenants, tenants who attend eviction clinics at Greater Boston Legal Services and at Rosie’s Place, visitors to the Court Service Center, and advocates at service organizations across Massachusetts. This is a Google Apps Add-On for developers of guided interviews in HotDocs. It speeds up creating HotDocs computations that can be tedious to create in the HotDocs computation editor. It also can help develop consistent and sustainable work methods for organizing large sets of variables. You can read the documentation and a more complete description of what it does and how it works. 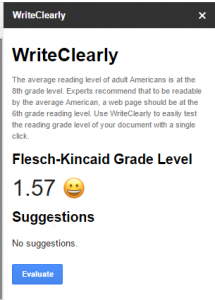 WriteClearly helps lawyers (and everyone) write in plain English. It was developed for Legal Assistance of Western New York and Idaho Legal Aid Services by Urban Insight as a bookmarklet. During a hackathon at the Technology Iniatives Grant conference in January, 2017, I helped create a Google Docs add-on that connects to Urban Insight’s new WriteClearly API. We published a working version and after the hackathon development has continued by Urban Insight. 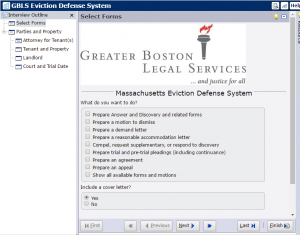 Many years ago, Greater Boston Legal Services and Harvard Legal Aid Bureau worked together to create a computer-assisted “Eviction Defense System.” It’s a TurboTax-like interview that helps attorneys quickly generate about 50 different forms and pleadings used to help defend against an eviction in Massachusetts Courts. The first version ran on VAX microcomputers, but it’s been updated over the years with changes in the law and to run on the more modern HotDocs platform. I’m currently working on a major overhaul to improve usability, further automate, and move that system online. One of my most popular repositories on GitHub is a new user creation script built around PowerShell batch processing. I’ve turned it over to our HR staff, who can now add users without needing to wait for our Helpdesk’s response. I did a quick writeup about the project on this blog.